Recently, thanks to my vast enthusiam for beauty and skincare and the start of my blog, my mum has begun to take note and has also suddenly become obsessed with throwing out everything she owns and buying a completely new makeup kit. This is perfect for me as it means I have a multitude of Mothers Day gift ideas this year. She loves Estee Lauder and is always asking my opinion on whether she should buy this blusher or that face cream, so I had a look over the weekend for some products that I think she would love. I also had a look at a few other brands that I think would be perfect for her and could expand her collection even further. The Origins Vitazing would be perfect for those days that she is only running small errands and doesn’t want a full face of makeup, and the Insolence eau Glacee will be a fresh and bright take on her favourite classic Insolence. 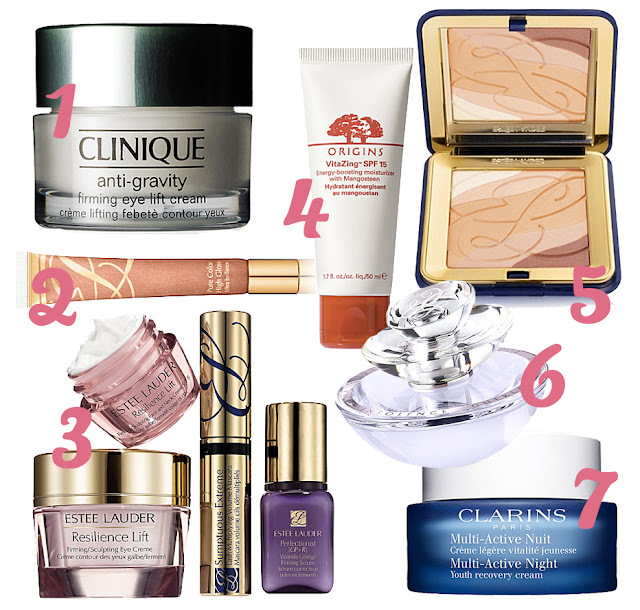 The Clarins night cream and Clinique eye lift creams are also something she would love to try and will be a special treat for her night time routine. Hopefully this will give you some inspiration for your lovely mums too. Happy Mothers Day for the 10th! Have you prepared you gift list for your mum yet?